PPC Paid advertising can be the quickest way to reach potential customers and generate new leads. Often referred to as paid ads, paid search ads, Google AdWords or Pay Per Click (PPC), these ads are seen at the top and side of major search engines. When your ad is near the top, you have excellent visibility. Getting your ad to appear near the top requires not just a good ad but also money; you have to pay more for the most prominent positions, just like in traditional advertising. However, the great thing about PPC is that you only pay when someone actually clicks on the ad (hence the name Pay Per Click). Essentially, you pay for the ad only when the most interested people notice it. 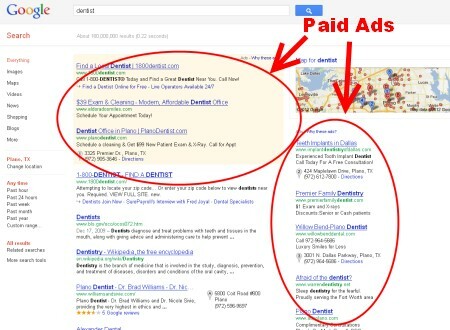 That makes PPC very cost effective, especially compared to traditional print ads. The cost of PPC depends greatly on the industry. The amount you pay per click is pretty much based on how much your competitors are willing to pay, which is usually proportionate to how much that lead is worth to you. Needless to say, the cost of a click for, say, plastic surgeon services will be way way higher than for, say, a local sandwich shop. Another great advantage of PPC is that we can easily track where visitors come from, what they do when they get to your site, and which ones convert into actual sales based on deals you’re offering. Analyzing this data helps us hone the advertising campaign into the most effective it can be, and this contributes to making your advertising dollars well spent. A well-managed PPC ad campaign can produce a much better return on investment than traditional advertising. It’s pretty easy to spend a lot of money on PPC advertising, although you should view it as an investment with returns, just as any aspect of marketing. LocalWord can create and manage your paid advertising campaign. Using the right keywords relevant to your business, we create ad copy targeted at potential customers searching for services and products that you provide. In addition to attracting new leads, you can also advertise special deals and sales you want to offer. Having a website (see Web design) is essential, and along with a good organic local search listing (see Local Search), you have the basic building blocks to search engine marketing. But since it usually takes some time to achieve good local search results, paid advertising can get you started reaching potential clients and customers more quickly. Some folks use PPC to jump start their marketing, and then rely on local search and other strategies for the long term.